The Indian car maker Mahindra and Mahindra has been quite active at the SUV frontier in India as well as all over the world. They acquired SsangYong Motors and brought the SsangYong Rexton to the Indian market which has been received very well by the Indian SUV lovers and Mahindra has had to ramp up the production of the car already. And as if this was not enough, they are planning another SsangYong product in near future as well, the SsangYong Korando. 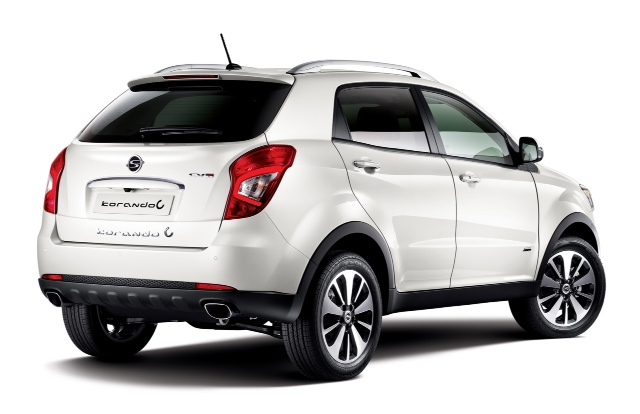 The SsangYong Korando C has been launched in Europe, this paves the way for its launch in other international markets, with a faint possibility that it might be launched in India too. It was looking quiet possible that parent company was seriously considering launching the Korando in India to give the compact crossovers like the Ford EcoSport some competition, but the recent market downturn may have halted plans as of now. Mahindra has re-iterated that it will not be launching any new products from its own stable, instead choosing to update its current range of vehicles. Whether the same mantra will also be applied to SsangYong remains to be seen. The most likely launch period for the Korando C, if it will be launched, seems to be the 2014 Indian Auto Expo in February. 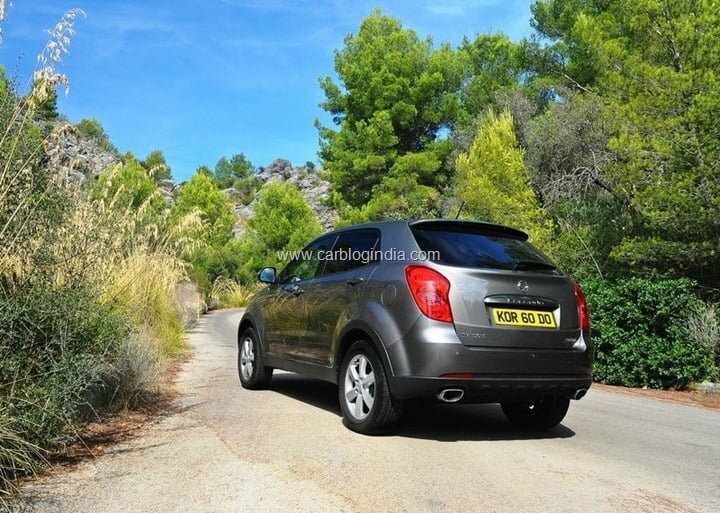 We will keep a close eye on developments related to the SsangYong Korando C. Keep following this space. 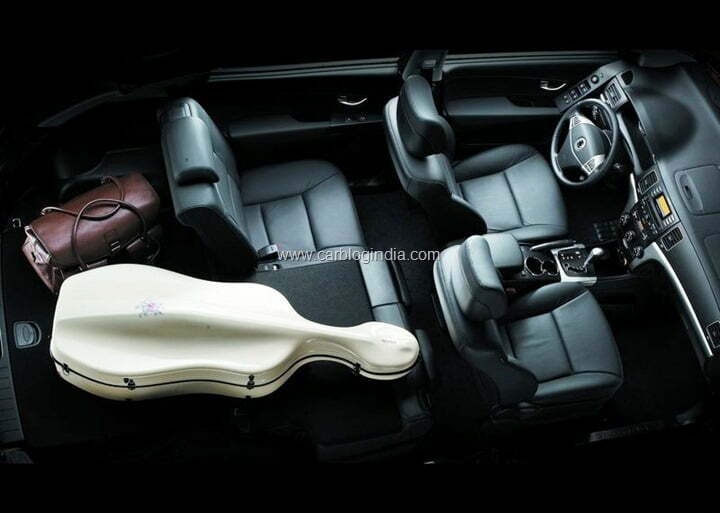 The SsangYong Korando C has been unvieled for the global markets, it was unvieled in Yeouido, South Korea. 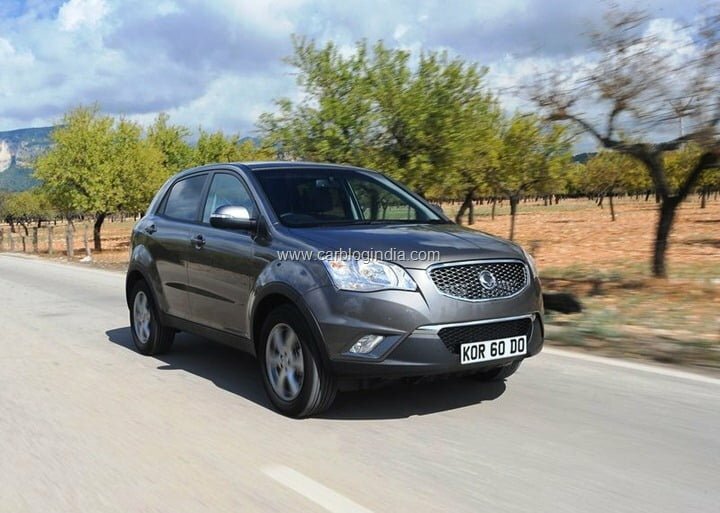 Called an ‘urban leisure vehicle’ by the company (it is basically a compact SUV), the new SsangYong Korando C is a minor facelift as compared to the one launched in 2010. On the outside, the dimensions of the car remains unchanged, what has changed are the styling elements at the front, rear and inside the SUV. Apart from the design changes the new Korando C also gets some new features. At the front, the Korando C gets projector headlamps, LED daytime running lamps, redesigned grille and air-dam on the bumper and new fog lamps. 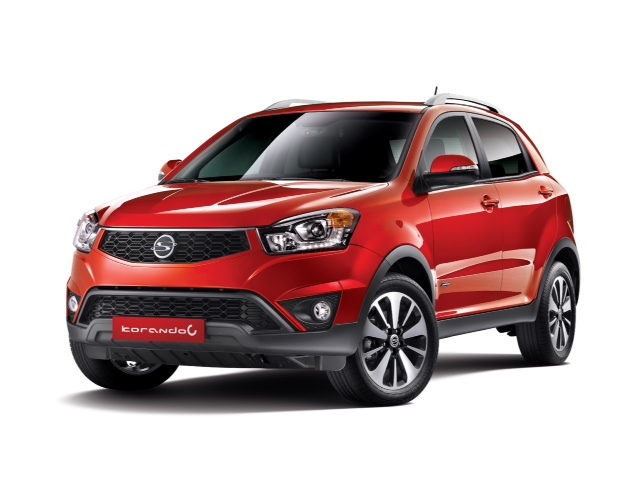 From the front, the new SsanYong Korando C looks smarter than before, becoming more angular, the pre-facelift SUV had a round-ish design theme. The changes to the rear are minimal, the name badge now features prominently on the boot than on the chrome strip above the number plate holder. The shape of the tail-lamp cluster is the same, but the elemnets inside have been changed, the brake lights are full LEDs, the indicator and reverse lights now get clear glass treatment. That’s it for the changes at the rear. 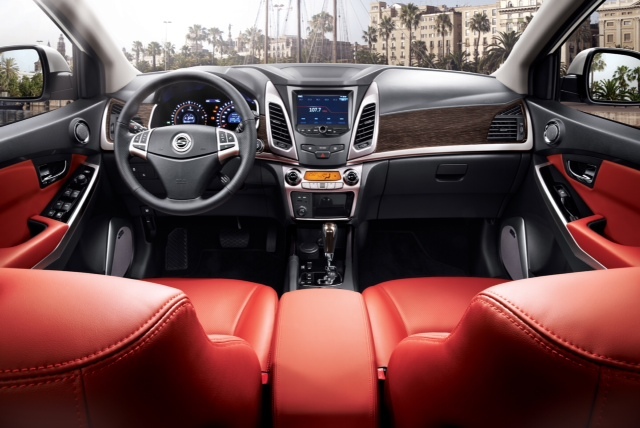 On the inside, the materials used on the dash and leathers on the seats have been changed, the dash gets wood inserts instead of plastic and the design of the dashboard has been changed. 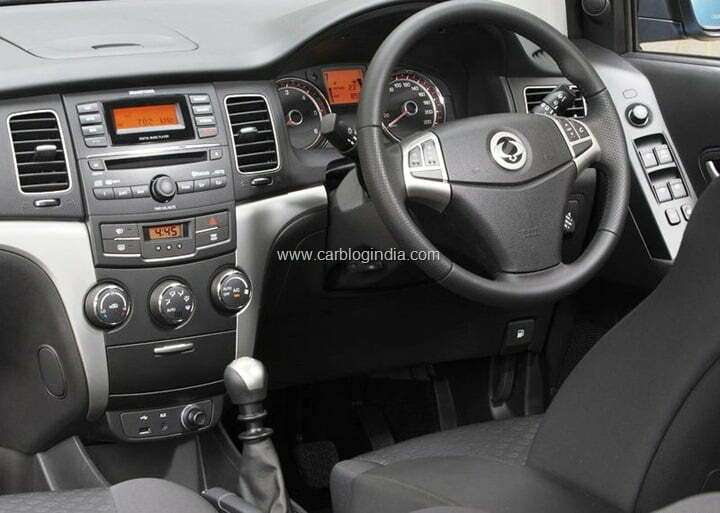 Apart from that, the centre console is now heavily modified, the new Korando C gets a 7-inch multi-function touch display, smarter media unit with Harman speakers, and an automatic climate control system replaces the manual A/C controls. The driver seat gets ventilation, with two fan speed levels. The position of the controls on the doors have been moved closer to the occupants. In terms of mechanicals, the engine remains unchanged but it has been tuned along with the transmission (manual/automatic) to imprive the fuel efficiency. The Korando C with manual transmission now gives 17.2 KMPL when driven exclusively on 2WD mode, while the automatic transmission equipped variant delivers 12.8 KMPL. This will be the SUV that Mahindra will bring to India sometime late in 2013 or early 2014. What do you think? Let u know in the comments. 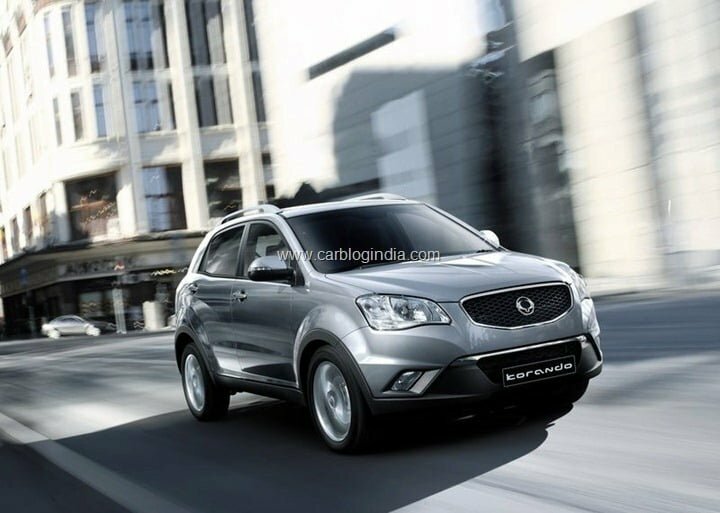 We have exclusive shots of the SsangYong Korando testing in India. Follow Car Blog India for more scoops. “We are working on the products. We studied market for both Korando and Rexton and decided that Rexton has a place in Indian market at present so that was given the first priority,” Mahindra & Mahindra Chief Executive – Automotive Sector P N Shah stated after he unveiled the Rexton in Kolkata. He also added that the company had not shelved the plans of bringing the Korando to the Indian market and were waiting for the right time to launch the SUV. Mahindra showcased the Korando and Rexton SUVs at the Auto Expo in January 2012 and out of the tow, the Rexton has been launched in the Indian market. Mahindra is following a strategy of phased launch for the car so as to keep the waiting periods low. Rexton is manufactured at the facility at Chakan plant which we believe will also be the home to the Korando SUV. Mahindra has already announced plans of investing USD 900 million for investment along with SsangYong which would be done to bring in new models in future. The Korando SUV will be slotted below the Rexton which makes us wonder if it will cannibalize the sales of their XUV 500 or become a dud seller because the VFM that XUV 500 offers. SsangYong is not a known brand in the brand hungry Indian environment, but seeing the warm welcome the brand has received makes us believe that it is the product which matters and not the brand.